SORBONNE UNIVERSITY - Paris — ANSO. Nestled among a XVII century group of building, Saint Ursule de la Sorbonne’s chapel has been closed to the public for about 20 years now. Having always been a place where you come to reflect and admire the stunning 32m high dome, the chapel is a Renaissance period building from 1642. On the dome are sculpted 4 well-known medallions representing the 4 different faculties of the University : Letters, Sciences, Medicine and Law. 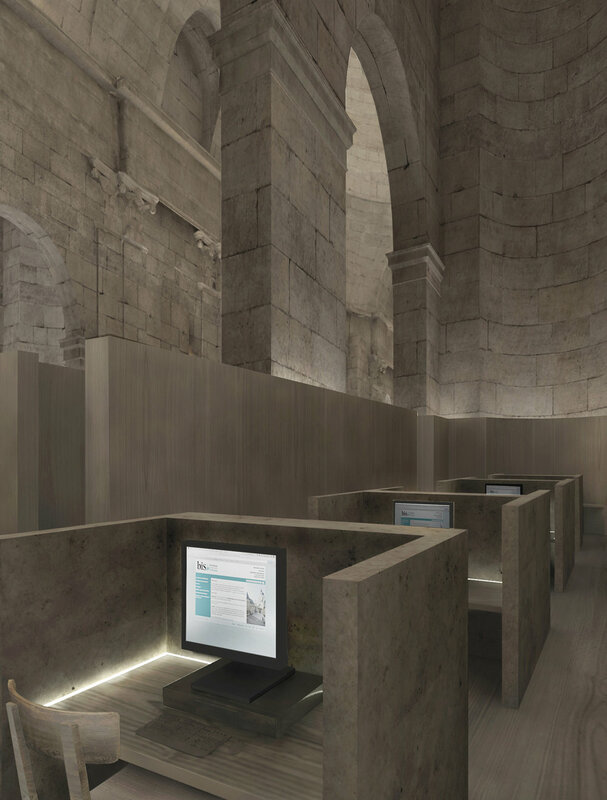 In order to give back the chapel its significant role (of honouring the 4 faculties) at the very heart of the Sorbonne Academy, the aim of the project is to reconvert the religious building into a media library. Working along with the existing archive library of the college, the chapel will be re open to member of the academic teaching team and students as well. The new architectural program is a one of a space entirely dedicated to imagery, wether numeric, pictorial, editorial or architectural. Cafe : A relaxing central space, designed as a monolithic piece of furniture hosting a pool which reflects the 32m high image of the dome. The reflexion create a 20m2 flat image that people can contemplate and sit around. The aim is to remember what the chapel stands for. Microfilms library : Individual work spaces to visualise rolls of microfilms archives. Video library : Communal spaces to watch video ressources of the university online platform. Press library : Communal linear spaces to read international newspapers, specialised books and the University journal. Study space : Communal spaces around a long linear table to study alone or within groups. The space is designed with natural, simple, and noble material, which are to grow old and used, in order to acquire a patina over time. They offer the inside space an everliving strength, in the same dimension as the chapel.